A Little TLC will Make This a Great Vacation Get a Way or Year Round Home. Great Price, Great location in Port Orange. 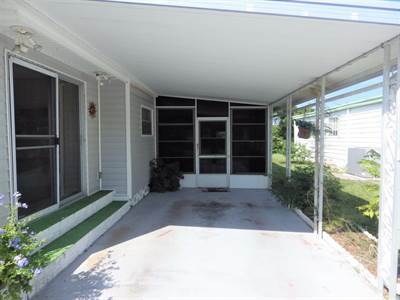 1976 2 bd/2ba-Living room, Family room, Florida room, dining room, open kitchen with breakfast bar. Nice laminate flooring in dining room and hall. Membrane roof over was installed in 2016. Large utility shed for additional storage includes laundry. Great back yard for weekend barbecues! A little TLC will make this a great vacation get a way or year round home. Senior 55/50+ park. Lot rent of $800.00 includes: Lawn Care, Standard Cable, 1st 1000 gallons water/sewer, trash pick up and taxes. Minutes to the beaches, Daytona Speedway and Shopping. Quick access to I-95 and I-4.